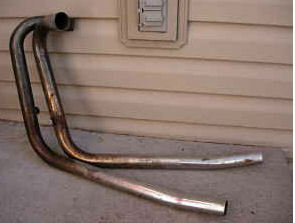 I have the following well used BSA Lightning Thunderbolt Exhaust Pipes and Headers for sale. The BSA Lightning A65 650 Exhaust Pipe have some cracks around the tab where they mount but I think they will be fine for your driver and the exhaust pipes may fit Triumph motorcycles, too. Strike Lightning Used Motorcycles for Sale would like to invite our visitors who are having problems with their own BSA Lightning Thunderbolt motorcycle to leave a description of the problem that you are having to see if somebody who stops by might offer a solution or give you some advice on how to fix your old BSA (and DON'T FORGET to leave your contact information in case they need to get in touch with you). The BSA motorcycle exhaust for sale is located in Idaho Falls and I'm asking $35 in cash. If you're interested or have questions regarding the fitment, condition or usability of the BSA motorcycle parts for sale you can reach me by e-mail using the comments form located directly below this ad (and don't forget to mention that you found this ad on Strike Lightning's Used Motorcycles for Sale gogocycles.com) . AND it would also be helpful if you would write a review of the BSA Lightning Thunderbolt to make others aware of any problems common to this bike or to list its positive features, make recommendations for desirable accessories or anything else you think we should know. We encourage you to submit your opinions on the BSA Lightning Thunderbolt Exhaust Pipes and Headers for sale if you have had experience with it, not to criticize the seller or to give the parts a poor rating but to help potential buyers make informed decisions and to benefit the biker community as a whole. This is exactly what I need. Do you still have these pipes?